I've been hand-making cards for so long that I didn't even realize how expensive they actually can be. I totally encourage you to be completely creative by making your own cards in honor of the holiday season, and other seasons to come. 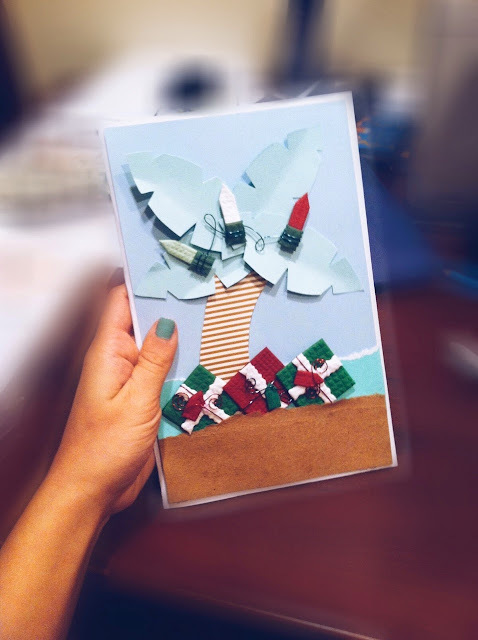 Last year I whipped up this beach-inspired Christmas card for my boyfriend LITERALLY 15 MINUTES before he walked in the door to exchange gifts. If you don't own a pack of plain card stock printer paper, you better go get some. All I did was neatly fold it in half, layered some blue and brown scrapbook paper to resemble the ocean, cut out a trunk and 4 leaf looking pieces, and glued. The Christmas lights and presents stickers are Jolee's Boutique stickers, who btw, have the cutest stickers in the game. Jolee's sticker line has so much variety that it's almost overwhelming, and they can be found at any craft store such as AC Moore, Hobby Lobby, or Michael's.